In French, “tuile” means “tile,” and it is a reference to the shape of the classic tuile. A tuile is a type of very lightweight, dry, crisp cookie. These cookies come in a dizzying array of shapes, sizes, and flavors, but every style tends to be delectable. Tuiles are also incredibly versatile, and they can be used for everything from ice cream garnishes to crusts for tiny, delicate tarts. Learning to make tuiles happens to be very easy and fun, and because these cookies are so versatile, you can play around with a tuile recipe a great deal. Using a rubber spatula, mix the almonds, sugar, vanilla extract or powder, almond extract, and egg whites together in a bowl. Melt the butter gently, and while it is still warm, pour it into the bowl. Mix thoroughly. Cover the bowl with plastic wrap and refrigerate overnight. The next day, sift the flour into the bowl and mix in thoroughly. Place teaspoonfuls of the dough on a nonstick baking sheet, spaced well apart. Preheat the oven to 300f(150c). Flatten each cookie with the back of a large spoon dipped in cold water, then bake for 15 - 18 minutes. The cookies should be an even golden color with no white in the center. Remove the cookies from the baking sheet using a metal spatula (i used a mason scraper) and slide into a sheet of parchment paper. Let cool. Sables are actually French Shortbread. Shortbreads are traditionally a Christmas cookie made with just four ingredients, butter, sugar, vanilla extract, and flour. They are a rich cookie with a delicate buttery flavor but according to Pierre Herme, the addition of egg whites gives these sables an extremely light and melting texture. Put the butter into the bowl of an electric mixer and beat until creamy. Add the sugar, salt. vanilla, and egg white. Mix for 1 minute, then add the flour. Mix on slow speed only just until the flour is fully incorporated with the other ingredients. This dough is fairly soft and cannot be made with your hands. If you do not have an electric mixer, it is fine to mix the ingredients together with a wooden spoon. Take care not to overmix the dough after adding the flour otherwise these sables will be not crunchy and delicate. Preheat the oven to 350f(180 c). Transfer the dough to a pastry bag fitted with a star tip. Pipe the dough in "W" shapes onto a baking sheet lined with parchment paper leaving /4 inch(2 cm) space between each sable. Bake until light golden, 12 - 15 minutes. Remove the sables from the oven and cool on a wire rack. When cold, dust with sifted confectioners' sugar. Historically, Lap means "ritual" in old Chinese, it was very often that surplus meat after the ritual would be cured for use in times of scarcity. These preserved delicacies are called "Lap-mei" in Cantonese and are often mistaken that they are waxed because of their waxy appearance and the word "lap" which also means wax in that dialect. There are three types of "Lap-mei"and they are preserved Chinese sausages, preserved pork, and preserved ducks. In Chinese tradition, they are usually prepared around the time of December of lunar calendar, as one of the delicacies to celebrate the 'Spring Harvesting Festival'. They are traditional gifts during the festive seasons, especially during the Chinese New Year. 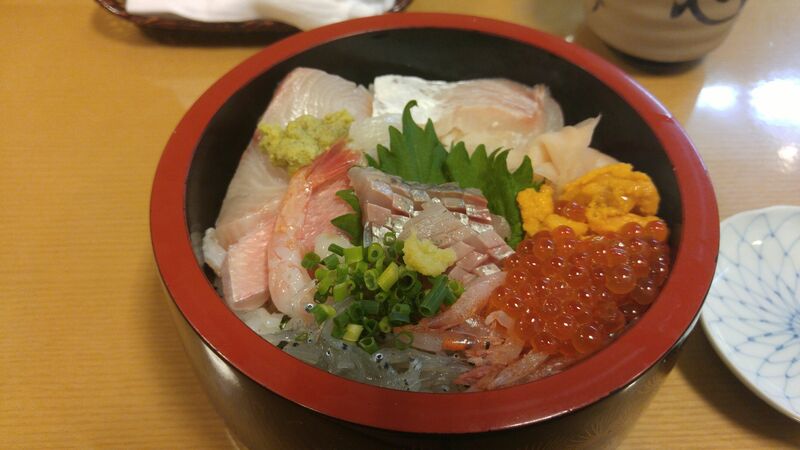 It has been found that 'Lap-mei' prepared commercially, has nitrite/nitrate and coloring which are not very desirable, therefore this gives me a reason to prepare 'Lap-mei' at home - preservative free. Cut belly pork into 1 1/2 - 2 inch strips. I was very surprised and happy that my Miss Picky Eater, ate 2 char siew paus, filling and all. Usually she would just eat the pau and leave the filling. She must be getting older and eating alot more, variety that is, like green leafy vegetables and fish. I will go to any lengths to make or cook the food she likes to eat and looking at her devout that 2 paus made me go looking for this recipe which has been with me for more than 30 years. I had been lazy and depended on the premixed cos pau flour is not readily available here and i have even asked the dim sum restaurants to sell me some of their stock but the reply is that they are always short. Anyway, the bleached all-purpose flour and wheat starch made pretty good paus - perhaps not as fluffy or perhaps it is not the flour, it is that i do not have the expertise to make them as fluffy. Even the folding of the paus, has an important part to play when it comes to making them smile. I noticed that more dough should be on top of the pau and don't be like me, leaving the knob behind. I must remember to break that knob away. Cut char siew into tiny dices. Heat wok with a little oil and add in the minced garlic. Saute until fragrant and add the diced char siew and the water and sauces. Mix well and thicken with waterchestnut solution. Cook until sauce comes back to the boil. Add in chopped cilantro and roasted sesame seeds and drizzle with sesame oil. Sieve the baking powder with the flour. Mix ammonium bicarbonate, kan sui and water and mix until ammonium bicarbonate is dissolved. Tear up the yeasted dough into small pieces and place in an electric stand mixer bowl,, add in the sugar, lard and the ammonium bicarbonate solution. Using the dough hook, knead until well mixed, Add in flour and knead the dough until it is smooth. Remove dough and spread dough out into a rough rectangle. Mix 1/2 tsp of baking powder with a little water and spread it over the rectangle. Roll it up and knead until smooth and not sticking to your hands. Divide dough into portions (i like to weigh them 35 gms each). Line the divided dough up. Start from the first portion, cup the dough portion with your palm and round it. Repeat with the rest of the portions, lining them up in order. While making the paus, fill steamer pot with water and bring to the boil. Roll the first rolled portion dough out into a circle and fill with a tablespoon of cooled filling. Pleat the circle up and seal well. (i roll the circle bigger, so that i can have more dough on top of pau. I find that more dough is good for the pau to smile. Remove the last pinch from the top). Put a piece of paper at the base of pau and leave in a steamer rack, covered with a damp cloth while you prepare another 6 more paus. Make sure water is in a rolling boil before putting the steamer rack with the prepared paus to steam for 10 minutes(if you are making bigger paus, then steaming time will be longer). Continue to wrap paus with the char siew filling and steam. These paus cannot be consumed yet as they stink from the ammonium bicarbonate. A second steaming of 10 minutes is required to allow the ammonium to dissipate. The root of the lotus plant, with its characteristic "wheel shape" cross section, has long been a popular vegetable in the Orient. It is the only plant in the world that actually grows in all three elements: earth (mud), water and air, perhaps this is why it is so medicinal and its exquisite flowers represent beauty and longevity. Besides its use as a food, all parts of the lotus plant - seeds, leaves, and flowers as well as the root - have long been respected in the East for their medicinal properties. In Oriental medicine, lotus seeds are eaten to increase energy and vitality and to aid digestion. Containing twenty percent protein, the seeds are also nourishing. Though the entire rhizome can be used medicinally, the portion where the links join has the greatest effect. The physical resemblance of lotus root to the lungs is a clue to its healing properties. Lotus root has traditionally been used to treat various respiratory problems. Small doses of the juice extracted from raw, finely grated lotus root is prescribed for lung-related ailments, such as tuberculosis, asthma, and coughing. It is said to melt mucus accumulation in the body, especially in the respiratory system. They are good for heart diseases, also to increase energy and neutralize toxins from our body. These fired lotus root slices make a very auspicious snack for The Chinese New Year. Lotus roots, in Chinese is " lin ngau " , which sounds like "lin yau", which means "every year you have plenty." Peel the skin off the lotus roots, then using a mandoline, slice into the thinnest possible of slices, soak alices in vinegared water to prevent oxidation. Drain and dry slices on kitchen towels. Heat oil to 300f and fry the slices by a handful. As soon as the slices turn slightly golden brown, remove with spider strainer and put on a cake rack to drain. Slices brown and burnt fast, so do not fry them until golden brown. When all the slices are done frying. Line them in single layer on a cake rack and bake in a 250 f oven until crispy. Sprinkle with salt when they are hot. 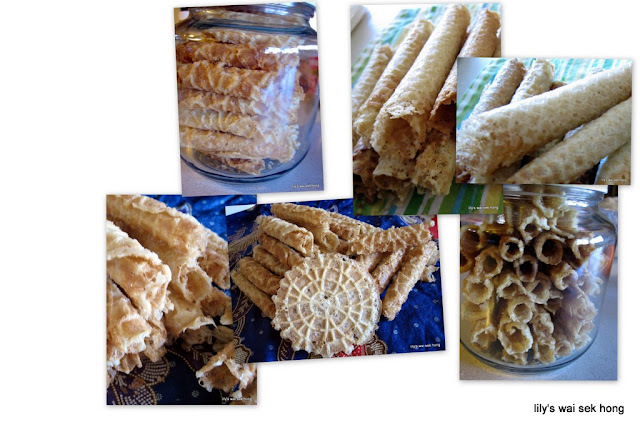 When i was making pizzelles, the urge to make Kuih Kapit with the pizzelle maker was great. 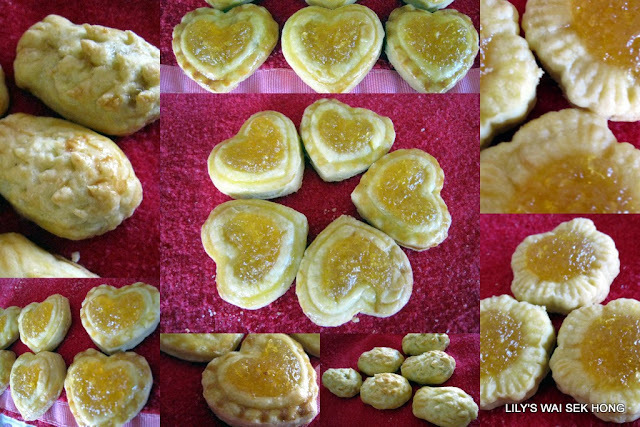 I have given up hope of making Kuih Kapit, especially for the Chinese New Year Celebration. Without the proper moulds and a charcoal stove, making good thin kuih kapit is quite impossible, but the urge is too great and i have to give it a try on the pizzelle maker. The result is acceptable, the taste and crispiness are there but the kuih kapit is thicker. A waffle-cone maker makes pretty good kuih kapit too. Sieve rice flour, tapioca starch, salt and baking soda together. Beat eggs and egg whites lightly and add in sugar, vegetable oil and coconut cream. Mix well. Add eggs and coconut cream mixture into the dry ingredients and mix well. Pass through a sieve and leave for 15 minutes while the pizzelle marker and/or waffle cone maker are preheating. Scoop a tablespoon of batter on to the pizzelle or waffle cone maker and cook wafer until golden brown. Using the handle of the wooden spoon, roll wafer into a cigar while it is still hot(for gentle fingers, use surgical gloves). Leave cigar on cake rack to cool before storing into aiirtight containers. The wafers might not be crispy evenly. In this case, cigars can be baked in a 250f oven for 5 - 10 minutes to further crisp them.